This may be the worst recession since the 1930s, but that doesn’t preclude spectacular runs of bullish behavior in the capital and commodity markets. In fact, the economic context of late probably inspires strong bouts of buying. But let’s not become complacent about supersized gains in beta. It’s been a great ride over the past several months, recalling the glory days of 2003-2007, when virtually everything was running higher and producing a bumper crop of self-proclaimed money management geniuses. But the basic fuel behind these gains of late—recognition that the world won’t end after all—is fading as primary mover of securities prices. Investors may start requiring more conventional catalysts, such as earnings and a plan for growth. Survival alone may no longer suffice as a reason to throw money at an asset class. In any case, the recent past looks quite stellar. May was the third installment of a powerful rebound in markets around the world. Virtually everything was up last month, with emerging market stocks and commodities exhibiting particularly strong leadership. But as the 1-year column reminds, even the three-month rally has only made a dent in the losses of late-2008. 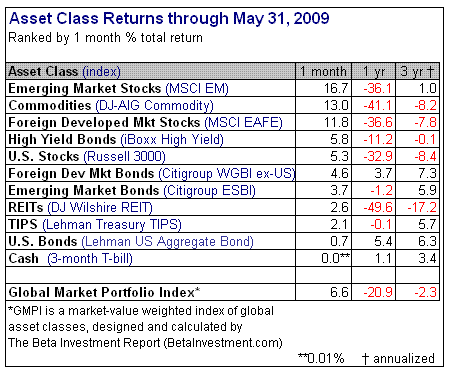 Save for bonds in the developed world, everything’s still showing a loss for the 12 months through May. As for the last three months, no one should be surprised that strong rallies have become so common. After the crushing losses that preceded the great spring rebound of 2009, it was virtually inevitable that prices would recover once it became clear that life would go on. But like all great snapbacks—and this one ranks, so far, as one of the broadest and strongest on record—the question is: What comes next? One could argue that the ricochet higher since March has been fueled mostly by reversing the apocalypse-based pricing that seems less applicable. The global economy is no longer precariously perched on the brink of implosion and the markets have reacted accordingly. But the all-or-nothing paradigm of the recent past is giving way to a more nuanced economic perspective. It’s time for post-apocalyptic pricing. There’s just one problem: No one’s quite sure of the pricing rules yet, in large part because the the rules generally for the money game ahead are still being hammered out. The task of pricing assets based on what comes next is destined to get a lot tougher. It’s looking increasingly likely that we’ll survive, but in exactly what form remains to be seen. Putting a proper valuation on the new world order is destined to be arduous since it’s still unclear how this new world order will function. Presumably, the politicians will alert us at the proper time. Meantime, we can bask in the glory of the past three months.